Seas0npass is the jailbreak tool similar to Greenpois0n and Redsn0w except it is only to jailbreak Apple TV 2G on Windows & Mac. Firecore group behind Seas0npass has released Seas0nPass 0.7.2 to support tethered jailbreak iOS 4.3 on Apple TV 2G with help of @nitoTV, @DjayB6, @p0sixninja and @msft_guy. Several news features are added in iOS 4.3 for Apple TV 2G which no doubt many would tempted to update Apple TV 2G to iOS 4.3. Seas0nPass 0.7.2 is only for Mac hence only proceed to update Apple TV 2G if you have access to Mac OS X and ready to live with tethered jailbreak on iOS 4.3 till untethered iOS 4.3 jailbreak is found . 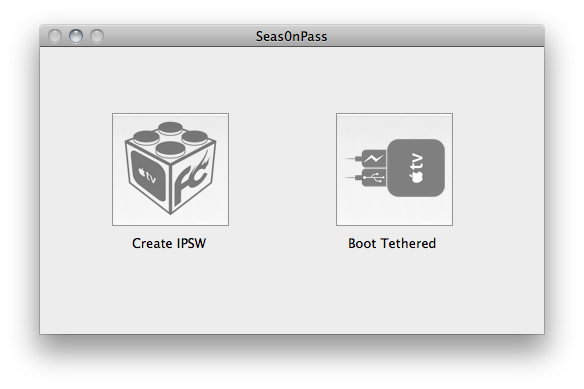 Download Seas0nPass 0.7.2 to Jailbreak Apple TV 2G 4.3 iOS on Mac OS X.